Who doesn’t wish for a long and healthy life? While there are many factors contributing to your health, maintaining a good diet is one of the important factors for overall good health. Eating a balanced diet rich in fruits, vegetables, lean proteins, healthy fats, whole grains, nuts, and legumes will provide you with the essential nutrients for optimal energy levels, for a strong immune system and healthy internal organs. In addition, consuming the right foods can help protect you from a plethora of the most common chronic diseases. Below we shall see a list of healthy foods which you should consume and a list of unhealthy foods which you should definitely steer clear from. Include all the 6 food groups comprising of grains, vegetables, fruits, milk, meat and beans and oils. 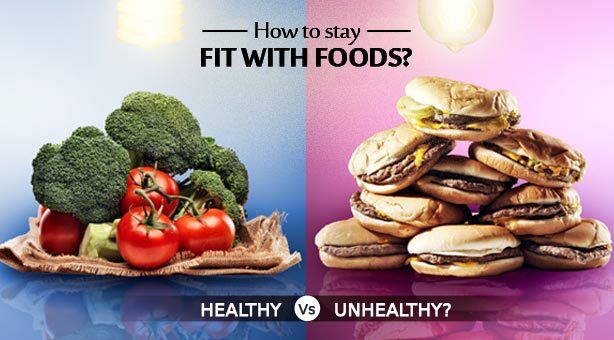 Limit your servings based on your age, body frame and the level of physical activity of each person. Eat lots of fresh vegetables because they are very rich in vitamins, minerals and fibers which will make you feel full. Eat a variety of fruits from each color to get the different vitamins that you need. Use low-fat milk (1% fat) or skimmed milk. Also, have low fat yogurt and cheese; these contain fewer calories and the same amount of calcium. Include legumes in your diet (lentils, chickpeas, beans) 2 to 3 times per week because they are nutritious and rich in fiber. Steer clear from these foods if you want to walk on the path of getting a healthy body. Bread. Due to the high Glycemic Index, these foods affect your blood sugar levels. Do not get tricked with ‘whole wheat’ or ‘healthy-grain’ labels. Processed Meat. These foods just have excess salt, fat, cholesterol, and very few nutrients, like fiber. Colas. Artificial sweeteners spike the production of insulin and that is not good for the body. Fruits Juices. Many fruit juices are actually little more than fruit-flavored sugar water. In fact, fruit juice contains just as much sugar as a sugary drink like Coke or Pepsi, and sometimes even more. Gluten-Free foods. The problem with many gluten-free diets is that people replace the gluten-containing foods with processed junk foods that happen to be gluten-free. These refined starches lead to rapid spikes in blood sugar and are extremely low in essential nutrients. Coffee drinks. It is loaded with liquid, empty calories, and will be just as unhealthy as any other sugar-sweetened beverage. Junk foods. These are little devils in disguise! The more you consume, the more it will lead to major diseases. A good rule to remember is that real food doesn’t need an ingredients list, because real food IS the ingredient.